A fourth-grade student at The Pingry School records a video for her “classmate” in Ghana. The girls worked together in their Level Up Village course this spring. Video exchanges are just one component of a much broader global learning program that Paige, along with her fellow Grade 4 classmates, were engaged in for eight weeks this spring at the Lower School. Facilitated by an educational organization called LevelUp Village, which offers an array of STEAM-focused, design-thinking courses, the program partners with schools around the globe to give students a unique learning experience. Not only are they learning about—in the case of Paige and her classmates—3D design and printing, they are collaborating on a project with peers from a country vastly different from their own. With the help of Lower School Educational Technology Specialist Jill Driscoll, the program was first introduced to Grade 2 last spring. Its success prompted expansion this year to fourth-grade students. And so, Paige, who was partnered with a Kenyan schoolboy named Nthenya, was wasting no time getting to know her new friend. Students at work engineering solutions using materials such as spaghetti and marshmallows in Global Storybook Engineers at The Pingry School. Along with Nthenya and her Pingry classmates, Paige was following an interdisciplinary course designed by LevelUp Village called Global Inventors. In addition to the one-on-one video exchanges about daily life in their home countries—all hosted on LevelUp’s online communications platform—with students from their partner schools in Kenya, Ghana, and Palestine, the fourth graders worked together to learn CAD (computer-animated design) and create 3D designs. LevelUp’s program encourages schools that are more financially able, like Pingry, to subsidize program costs for their partner schools abroad, which are located in developing countries and often wrestle with unreliable access to electricity. So, by using a 3D printer (which Pingry supplied to its three partner schools) and CAD software to make and modify a series of designs, Lower Schoolers worked with their African and Middle Eastern counterparts to create—and 3D print—solar-powered flashlights, among other inventions. “Engineering solutions to real-world problems,” is how LevelUp Village describes its Global Inventors course. But at the Lower School this spring, for three days out of a six-day academic cycle, the ebullient look on the faces of students as they opened a new video message from their friends abroad proved that it was far more than an academic exercise. 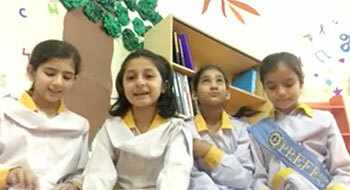 These students in Pakistan were paired with Pingry students for a Level Up Village global collaboration. While fourth-grade students were learning about CAD software and renewable technology, second-grade students partnered with their own classrooms in Nicaragua and Pakistan for a LevelUp course titled Global Storybook Engineers. Swapna was referring to Strega Nona, an Italian folk tale, which she and her classmates were reading alongside students in Sara Berg’s class as part of the course called Global Storybook Engineers. Both classrooms, in different parts of the world, would soon receive packages from LevelUp, filled with essential tools like marshmallows, tape, and string. Their task? Build a tower strong enough to withstand an avalanche of pasta, and help save the townspeople in Strega Nona’s village. This boy at The Pingry School has designed a tower to rescue a storybook character in Global Storybook Engineers, a course that combines engineering with literacy. Similarly, students in Sally Dugan and Mary Ogden’s classes, who were also taking Global Storybook Engineers in conjunction with schools in Nicaragua, were also reading Strega Nona, as well as Jabuti the Tortoise. They, too, were faced with several design-thinking challenges: build a packing system that protects Jabuti’s shell when dropped; use recyclable materials to protect an egg so it doesn’t break when dropped; design a boat that can hold 100 pennies without sinking; and create a path that a “brushbot” (toothbrush robot) can navigate through successfully without falling over. Like their fourth-grade peers, video exchanges with their partner schools helped the students in Grade 2 to compare notes on their projects, share what obstacles they were encountering, and discuss the similarities and differences of their school lives. (To add another layer of global connection, language teacher Diana Fiore coached Mrs. Dugan and Mrs. Ogden’s students to present their video exchanges to Nicaraguan students in Spanish.) Ms. Berg’s students, partnered with the school in Pakistan, had the added benefit of a first-hand perspective closer to home: the mother of Moeed Khan ’27 was born in Lahore, Pakistan, and visited class one day to share a bit about her culture. Mrs. Khan P ’25, ’27, originally from Pakistan, shares details of her native country with Pingry students to provide more context and background for the students’ Level Up Village global exchange. This article was originally published on The Pingry School’s news page. Andrea Dawson: Currently a Senior Writer in the Office of Communications at The Pingry School, Andrea Dawson worked for 13 years as a book editor at W. W. Norton & Company in Manhattan.